As we get older, we tend to take more stock of the things that benefit us our lives the most – like the relationships we’ve built, the memories we’ve created, and the personal experiences we’ve been afforded along the way. Exercise, believe it not, is one of those things that should be recognized for its numerous benefits at all stages of life. 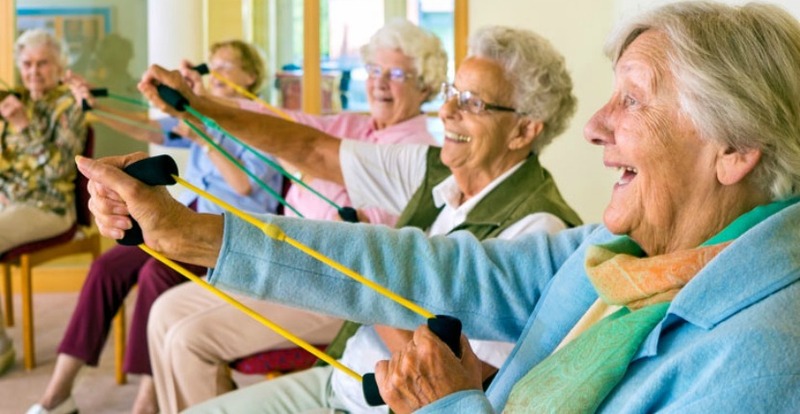 Unfortunately, there are a lot of misconceptions about the advantages that exercise offers seniors. Many older adults believe it’s too late – at their age – to start an exercise routine. But nothing could be further from the truth. In fact, studies show that regular physical activity can actually increase your life expectancy no matter what age you begin your regimen. Many seniors are concerned about injuries and falls as they consider the pros and cons of working out. This is a very valid concern, as statistics say that almost half of all seniors who suffer a hip fracture lose their independence. It’s helpful to know that an approved fitness routine can actually reduce your chances of falling if done correctly and helps you maintain both the agility and independence to keep doing the things you love to do. Age brings with it a loss in bone mass. The best way to increase strength and balance is through regular exercise. Strong bone density lowers the risk of falling, reduces the risk of osteoporosis and helps prevent broken bones. Often times older adults suffer from chronic pain or arthritis and the last thing they want to do is exercise. Surprisingly, research has proven that moderate physical activity is beneficial in preventing the progression of arthritis, while improving overall function. Doctors also consider exercise the best non-drug alternative to improving pain and movement in osteoarthritis patients. Patients also flourish with personalized elder care and some forms of alternative therapy. Truthfully, the most difficult part of fitness when experiencing these conditions, is getting started. According to Lynn Millar, PhD, a professor of physical therapy at Winston Salem State University in Winston-Salem, N.C. it’s normal to feel mild discomfort in the beginning, but the pain usually subsides pretty quickly. While being sedentary increases the risk of developing mobility problems, walking a few times a week and the practice of tai chi (slow deliberate movements) can help restore flexibility while improving balance. In addition to all of the positive physical aspects of exercise, there are a number of mental benefits, as well. FHC found that a regular workout routine can also help relieve stress, boost endorphins, alleviate anxiety, and prevent cognitive decline. So, if you’re considering whether working out is right for you, talk to your doctor in order to make the best choice for your body and your health.